I like museums. I hope one day to be the director of my own museum. Not a Museum of Derek Jensen, of course; no one would go to that but my mom, and she wouldn't want to stay long. "I've seen it," she would say. The Rock and Roll Hall of Fame is a pretty good museum, as these things go. It doesn't have quite as much interactivity exhibits as I would have hoped, but it's a suitable venue for enshrining Britney Spears's "Oops, I Did It Again" costume. Actually, Britney's costume was pretty cool (it's denim with leather inserts shaped like flames stitched up the legs and around the denim top). I would have taken a picture, but the Man has got his roolz all up in the damn joint. Apparently the artists are afraid someone will copy their costumes or maybe their signatures or something. Artist signatures are displayed prominently in the actual "hall" of fame, which is really more of a dark, upward-sloping corridor of fame. It would be cool if it went the other way. Then it would be a dark, downward spiral of fame. At the bottom could be drug paraphernalia and aircraft wreckage. The Man allows sketching, tho (I had a sarcastic discussion with the coat-check person, whose main job is actually camera-checking), so a decent fashion designer or forger could steal anything he or she wanted. The building is in the shape of a pyramid, for some reason. It's a pretty cool design (somebody went to France and sketched the Louvre, I suspect). And it looks great framed against Lake Erie in the sunset. The lobby, where you can get away with taking a few pictures before descending into the museum proper, has some pretty wild displays of the cars U2 used in their ZOO TV tour. These are Trabants, notoriously awful East German cars that had two-stroke engines. They're decorated in weird ways that must have sounded good after a couple of Irish whiskeys on the tour plane: mirrors, animal prints, pastels, words. I think it would have been cooler to have them done up as police cars chasing a fleeing dissident with a guitar. Achtung, baby! There are also some big guitars decorated by various artists (fine arts artists; not music artists). The guitars are done in the same spirit as the cows done for Chicago and the flying pigs done for Cincinnati. It's a sort of safe, predictable art form that produces "municipal-quality" artistic expression. I suspect that free-form abstract sculpture is the nightmare of city councilmen everywhere. "We paid $300,000 for a 40-ton twisted loop of steel with a hole at one end? What the hell is it?!" At the top is a terrific display of Pink Floyd's The Wall stage props (a wall, couch potato guy, and a giant inflatable caricature of the headmaster) and also the giant heads from their Division Bell album cover. Down below are some stage props used by Phish: a giant hotdog, fries, and a soda. There was Jon Bon Jovi's motorcycle and Roy Orbison's sweet red Corvette. Inside the museum are mostly displays of artist's costumes and some memorabilia, like receipts for Elvis's $30,000 ring and John Lennon's grade school report card ("Childish and chatty. Needs to address habits that will not serve him well in later life."). Cool, but not life-affirming. The exhibits are arranged mostly chronologically, and it was a bit shocking to find Duran Duran and the B-52s displays in the 80s section. Sheesh. 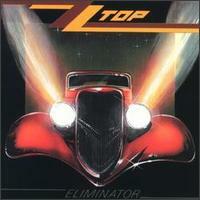 ZZ Top's actual Eliminator car was great. And it was cool to see Angus Young's Australian school uniform and read that he wears them as a gimmick since he showed up to practice at 15 in his actual school uniform. One of the more fun parts of the museum was listening to music from "early influences" that shaped rock and roll. Elmore James, Willie Dixon, Les Paul, the Singing Brakeman, Howlin' Wolf... gospel, country, and blues artists who deserve recognition in their own right, many of which I'd never heard. I would have liked to have seen exhibits that let me play with beats and melodies to find the right mix. Or that let me isolate tracks of a famous song (drums, vocals, backup, rhythm, bass, lead guitar, etc.) and remix them. I know that art museums don't show you how artists paint, but I wanted to see more how the music comes together. And I wanted a nice, clear demonstration of the progression from blues, country, and gospel into rock and roll, including that crucial crossover point where "something" was rock and roll instead of something else. There are plenty of examples of rock and roll songs inspired by or directly translated from those roots (from Ray Charles's "I've Got a Woman" to Eric Clapton's "Crossroads Blues"). I would also have liked to have seen recreations of a Who concert stage with Pete Townsend smashing a guitar or a recreation of Sam Phillips's Sun Records studio, with Elvis laying down "That's All Right (Mama)" while Johnny Cash practices "Folsom Prison Blues." That would bring the experience to life more than static displays of costumes, album covers, and records. And I would have liked to have been allowed to take pictures.